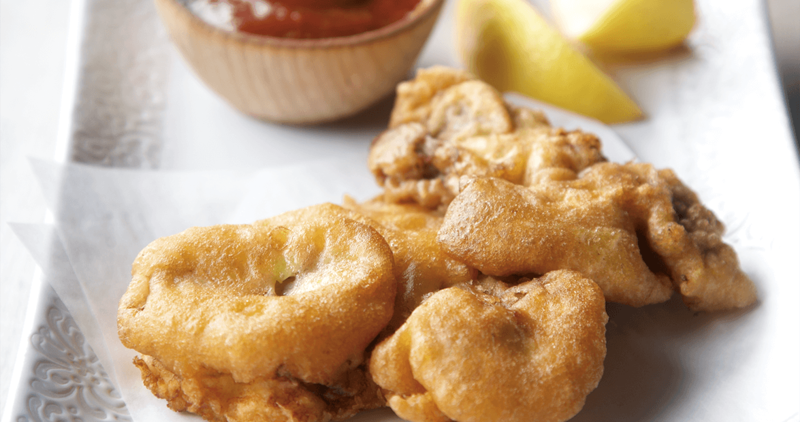 Use oyster liquor or clam juice to make a snack that’s deliciously fried and full of flavor. Yields: 12 or more fritters. Preheat oven to 250°. Line a baking sheet with paper towels. In a mixing bowl, mix eggs and flour together into a thick paste. Add as much of the liquid as is required to make a thin batter that is thick enough to hold together when put into the hot fat. Pour enough vegetable oil into frying pan to reach a depth of ½ to 1 inch. Heat over medium-high heat. When oil is hot, hold the bowl over the pan, and dip oysters into batter one by one, then drop 2-3 oysters together in a cluster to make one fritter. Or, pour a spoonful of batter into the oil, then quickly add a couple of oysters. If you’re making clam fritters, spoon a dollop of batter into the oil, then quickly add a spoonful of drained clams to the batter. Cook each fritter until golden, then flip and cook the other side. Remove and drain on paper towels, on the baking sheet kept in the warm oven. Serve stacks of the fritters on a serving platter, along with ketchup, mustard, cocktail sauce, or sour cream.